Microsoft on Wednesday updated Office 2016 for Mac, adding not just bugfixes but new features for all of the apps in the suite, such as Outlook and PowerPoint. Outlook users can now exploit the fullscreen mode in OS X Yosemite and El Capitan, making it possible to see multiple items side-by-side. For business users, the update makes it easier to locate a free conference room at a specific time. Word users can save PDF files to flash drives, while OneNote has gained support for the shapes gallery and the ability to add shapes to pages. Both Excel and PowerPoint have new selection panes that keep track of objects and let users rearrange them at will. The update, v15.18.0, can be downloaded directly from Microsoft or else installed through Office's AutoUpdate system. People must have an active Office 365 subscription. 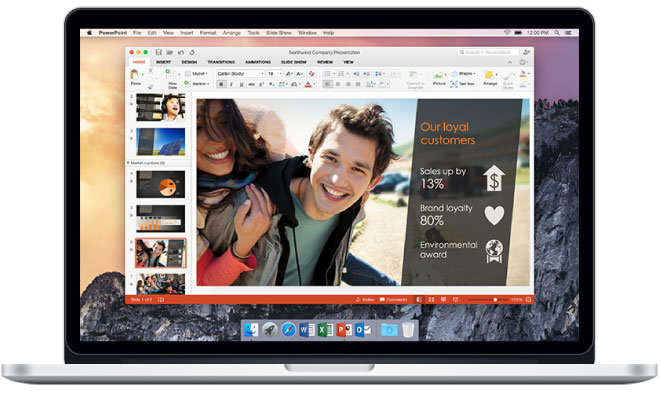 Office 2016 first reached the Mac in July, but only attached to Office 365. In September, Microsoft released separate editions that don't require monthly or annual fees, but aren't updated as frequently.